Forget all about that. There’s much more to gain by having general principles which apply to many situations. In this post, I’m going to show you one of my favorite software design principles in action, the Embedded Design principle. The Embedded Design principle, which I briefly introduced in a previous post, states that you should always code in a way that makes the design apparent. It’s like pixie dust in its ability to make code more readable, loosely coupled, and impervious to bugs. It’s also hard to grasp, because programmers rarely see a program’s design in first-class form. So, in this post, I’ll show you an example. Meet Bob. Bob is an engineer at AwesomeSauce.com. 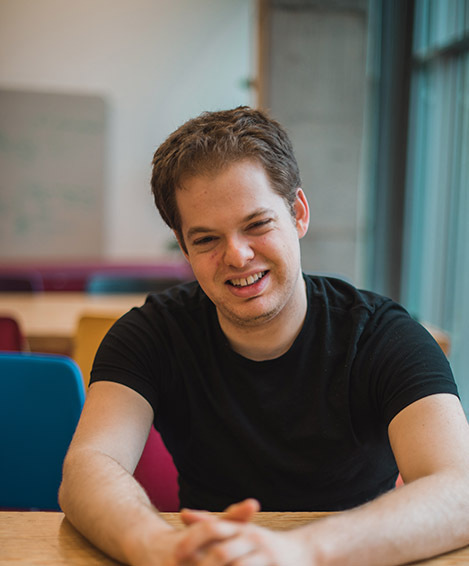 He’s only been there a few months, but he has a project that will affect everyone: he’s going to create the website’s stats page! Now everyone can see just how engaged AwesomeSauce’s users are. Bob starts coding. There are three data items, and each one will print either a computed or cached value. Bob ended up using one chunk of code for each data item. So simple! As the stats page gets bigger, it will be easy to add more by repeating the pattern. Bob sends it to Charlie for review. It’s 6 months later. AwesomeSauce.com has been growing faster than the national debt. AwesomeSauce needs more frequent updates to the stats page to show this. Team lead Denise decides to double the refresh rate, and Charlie does it. Bob is displeased. They had previously decided all stats should refresh simultaneously; see how the mockup just has one “Last updated” time. “Oops,” says Charlie, and together they merge the if-statements to prevent a future mistake. AwesomeSauce has hit a jackpot! Writers are making 10,000 posts per day. One day, an AwesomeSauce engineer notices they have a big slowdown twice a day, at noon and midnight. After a full day of sleuthing, he discovers that it has something to do with how, at cache refresh time, the stats page is taking a full three minutes to load. With horror, he discovers the call to countWords(), still living, though its results are unused. 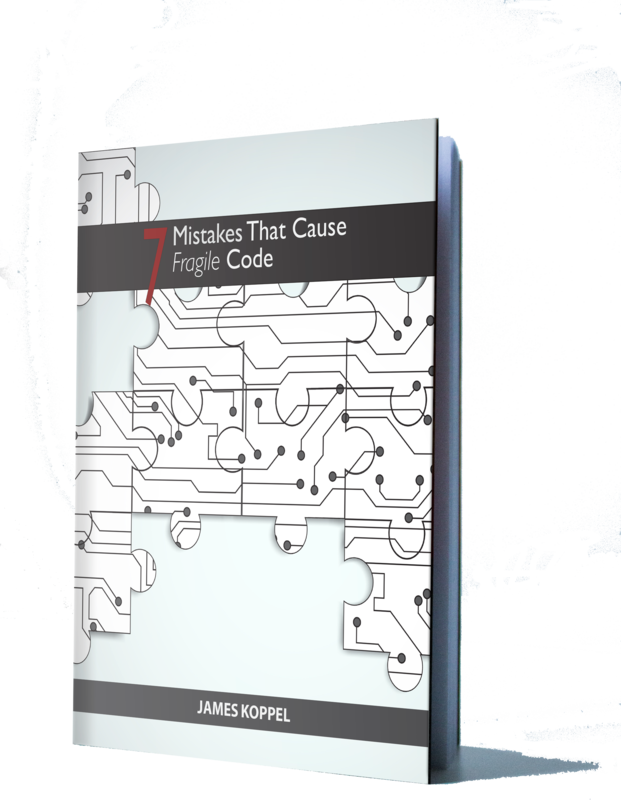 This was not merely an instance of “mistakes happen.” This was a heavy price paid from badly-designed code. Everything from the first bug to the site slowdown could have been prevented by structuring it better, and the way to structure it better is a simple application of the Embedded Design Principle. Standard disclaimer: When reading software design advice, always imagine the examples given are 10x longer. Overengineering is bad. But, if you’re not sure whether applying a technique to your code would be overengineering, error on the side of doing it. Abstract early. Update, 9/14/2018: Some people attacked this, saying "abstract early" is terrible advice. This is a tangent to the rest of the post, and if I interpreted it the same way they did, then I'd certainly agree. But please read the linked Jessitron blog post to see what this is actually saying. In the first version of the code, the computation, caching, and display of each statistic were all independent knobs, 3*N in total, where N is the number of stats to display. Merging the if-statements combined the N caching behaviors into one knob, bringing the total down to 2*N+1 knobs. Nonetheless, this still made it possible to compute a stat without displaying it. This was the rope that hung AwesomeSauce with the twice-daily slowdown. This example was extreme, but ones like it are real. A static analysis researcher I know once visited eBay. She was shocked to discover that the checker that excited the engineers the most was one of the most shallow: detecting unused variables. Each unused computation eliminated was a database call saved, and a nibble taken out of server costs. 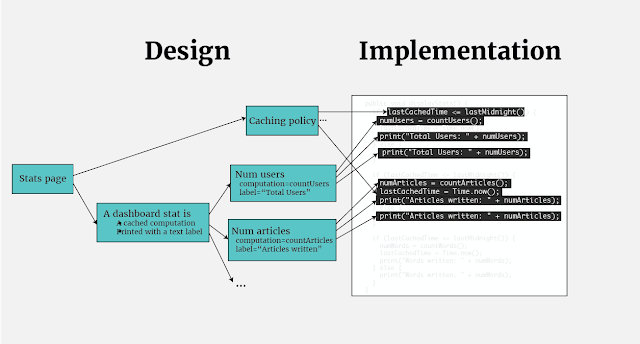 This diagram gives a rough picture of concepts used in the design of the program, showing how the concept of a dashboard stat is instantiated multiple times, and how the concept of each stat is built into the code. This diagram is far from complete; it omits, e.g. : the choice of the English language. But, with it, we can see several things. The same caching behavior is implemented multiple times, which made the bug in Bob’s first version possible. The code is indistinguishable from an alternate design where each stat has its own caching policy. This is another example of why design recovery is in general impossible. And finally, each dashboard stat gets expressed in multiple independent lines of code, each its own “knob.” Hence, the slowdown that plagued AwesomeSauce. All can be fixed — and the code rendered beautiful — if we take all those many arrows emanating from those boxes on the right, and reduce them down to one per box, one line of code per low-level concept. This is the true version of the “Don’t Repeat Yourself” (DRY) principle. In Zen and the Art of Motorcycle Maintenance, Robert Piersig illustrates these higher-level concepts, which he calls forms, in the world of mechanics. A motorcycle is a power assembly and a running assembly; the power assembly can be divided into the engine and the power-delivery assembly; and so on. A mechanic that’s testing the spark plugs or adjusting a tappet is really working on these higher-level forms. And yet you cannot walk into a motorcycle parts shop and ask for a power assembly: these concepts only exist in the mechanic’s head. But we’re programmers, and we have tools that translate our thoughts into CPU instructions. To a certain extent, we can actually build these forms directly into our code. Let’s create a value representing a DashboardStat. With these higher-level concepts turned into code, Bob’s original dashboard page can now be written declaratively. This code is just too simple to fail. If this example refactoring was too much, there’s a simpler compromise. Don’t have a DashboardStat value; just have a DashboardData which hardcodes each of the computations. This is much less overhead than the way I did it above, but it still dictates that all stats should be computed in an all-or-nothing fashion. Extract the check for whether to recompute into a shouldUpdate method. Now your decisions about cache timing are reified in a separate chunk of code. To go one step further, the caching policy could be parameterized. Many programmers will get a sense that something was off about the first example. Every programmer I’ve shown this example to knew they should merge the if-statements and factor out the prints. But the ones who knew they should refactor out a “dashboard stat” value only did so by flash of insight, and couldn’t articulate how they came up with it. But by instead thinking about how the code is derived from the design, this refactoring becomes just a straightforward application of the Embedded Design Principle. Finding a good structure for the code was easy once we saw the structure of the design. So always think beyond the code. Ask yourself about the concepts of your program, and the values that define them. Like Piersig, this is what turns you from the mechanic turning screws into the engineer and artist building something to be proud of. But what if you didn’t have a clear picture of how this code was derived, and you want to just be able to look at the code and realize there’s a deeper concept that should be extracted? There is a way to do that, and, for that, you’ll have to wait for my next post. Like this post? You may be interested in my Advanced Software Design Web Course. Thanks to Alex Reece, Elliott Jin, and Mimee Xu for comments on earlier drafts of this post. Wouldn't it be better (i.e. simpler) to make a function that takes a function to check if the cache is stale and a list with a function for each stat and returns a list containing the values. This would best be used by calling it with lambda/anonymous functions and looping over the result. No more duplication or bloat! The first part of that design would generalize the caching policy more than this one does. The second part is approximately the same as this design: a list of stats, where each stat is principally the function that computes it. The main difference is in whether to define a stat as a function, or as an extensible record. This design does the latter; it says that a stat is an interesting concept that may contain other information. Using an extensible record (i.e. : an object) adds a small amount of indirection, but also means little code need be changed to add more information (e.g. : it already has the name), and also allows for information hiding. Plain English test: if you have a list of functions, and you find yourself describing it as "this list stores all the statistics in the dashboard," that's an indicator that a dashboard stat is actually a design concept that deserves its own type. You've made a decision to represent a stat as a single function, and the decision "a stat is a function" should be made explicit. Word of warning when chasing the "simple" solution: It's very easy to deceive yourself into thinking you've found a simple solution by hiding a lot of the complexity in implicit assumptions and dependencies. (Prime example: https://www.mongodb.com/blog/post/mongodb-vs-sql-day-1-2 .) A lot of people, as they get better at seeing the hidden assumptions, may look at code they once thought was simple and realize it's actually terrible.